I'm carrying on what you yourself began, and I'm creating a brand new world, one heart at a time. This article is under construction. You are free to help improve it. Please consult the Manual of Style before doing so. Oh no! The water! I'm in big trouble if I don't fetch it! This article requires cleanup or improvement. Please help out by editing this page. Please see the Manual of Style and Editing Help before getting started. Inflicts enemies with paralysis. If you encounter this Heartless in a group, defeat it first before it toots its own horn! 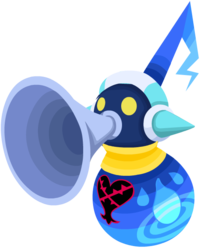 The Rainy Loudmouth is a Heartless that appears in Kingdom Hearts χ. As customary with other Heartless of its species, the Rainy Loudmouth's body is round and limbless, with a Heartless emblem centered on its chest. The body is a mixture of several different shades of blue, with a large raindrop and water ripple on the lower part of its body. Its neck is a bright yellow. It has two short, turquoise colored horns on both sides of its head, and a matching pattern decorating the top of its head in a headphone like fashion. The Rainy Loudmouth has two beady, yellow eyes and a periwinkle bell resembling that of a musical instrument. The head and attached antenna resemble that of an eighth note, with the head starting a dark navy blue and slowly lightening up as the antenna grows. This article about an enemy from the Kingdom Hearts series is a stub. You can help Kingdom Hearts Wiki by expanding it. This page was last edited on 3 April 2019, at 18:34.